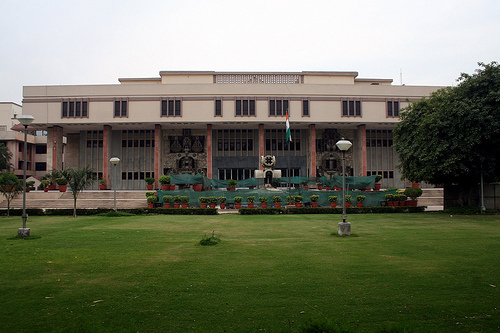 Our very own Delhi High Court was established in the year 1966, and I must say, what a monumental event it was. It’s the year 2015 now, and we are still in love with it. Over the years, the Delhi High Court has grown and expanded to keep pace with the inevitable demands bound to be put upon it. I personally find the Delhi High Court to be one THE best Courts to practice law. So without further ado, here are my top 5 reasons for loving the Delhi High Court with all my heart. One of the biggest reason why I love the Delhi High Court is the fact that it has been constructed with a lot of attention to detail. The main building (also referred to as the “old building” or “civil side”) has arguably the best architecture I’ve seen in any Court so far. It’s built in such a way that one can see every corner of the entire Court building on every floor right from the top floor. Also the fact that the roof of the building has big windows allows for natural light to radiate through the entire Court building during a sunny day giving it a very homely feeling. Considering that summers are a real nightmare in a city like New Delhi, the fact that the whole Court building is centrally air-conditioned is one of the biggest relief for lawyers and litigants. Trust me, sometimes the Air-Conditioner is turned so high that I’ve actually felt numbness in my hands while sitting inside the Courtroom waiting for my case. There are comfortable sofas on every floor outside the Courtrooms where litigants can wait for their case and lawyers can do their last minute revision. Did I mention that the Courtroom of the Hon’ble Chief Justice is HUGE? It’s like the best Courtroom ever. The roof must be 25 feet high at least, with comfortable sofa chairs for the lawyers to sit. It’s truly an awesome sight to see all the Hon’ble Judges of the Delhi High Court in that Courtroom during a full Court reference. The rest of the Courtrooms too are decently sized with the same kind of sofa chairs. It’s truly a pleasure just to watch the Hon’ble Judges and the lawyers during the court proceedings. There are a lot of little things which I’m probably forgetting at this moment but overall, looking at the Delhi High Court building, the color scheme, the design, the architecture and the facilities, it really make you realize as to how much thought was put into it during construction and how every little detail was carefully taken care of.